Researchers identify internal variability of the Indian monsoon as a significant driver of Atlantic tropical cyclone tracks. An Indian monsoon steers tropical cyclones across the Atlantic. Credit: Mike Perkins and Patrick Kelly, PNNL. Enlarge Image. Large-scale environmental forces known as "steering effects" are a key factor governing the path hurricanes take after they form. Understanding variations in these steering effects has important implications on the prediction of tropical cyclones (TCs) and their associated landfall probability. For the first time, a research team led by the U.S. Department of Energy's Pacific Northwest National Laboratory (PNNL) draws a link between the steering of Atlantic TCs and remote rainfall anomalies near India. Observational and modeling evidence demonstrated that a stronger Indian monsoon drives Atlantic TCs farther west due to large-scale steering changes. Hurricane impacts, such as landfall probability, depend on a variety of factors including intensity, frequency, and steering effects. 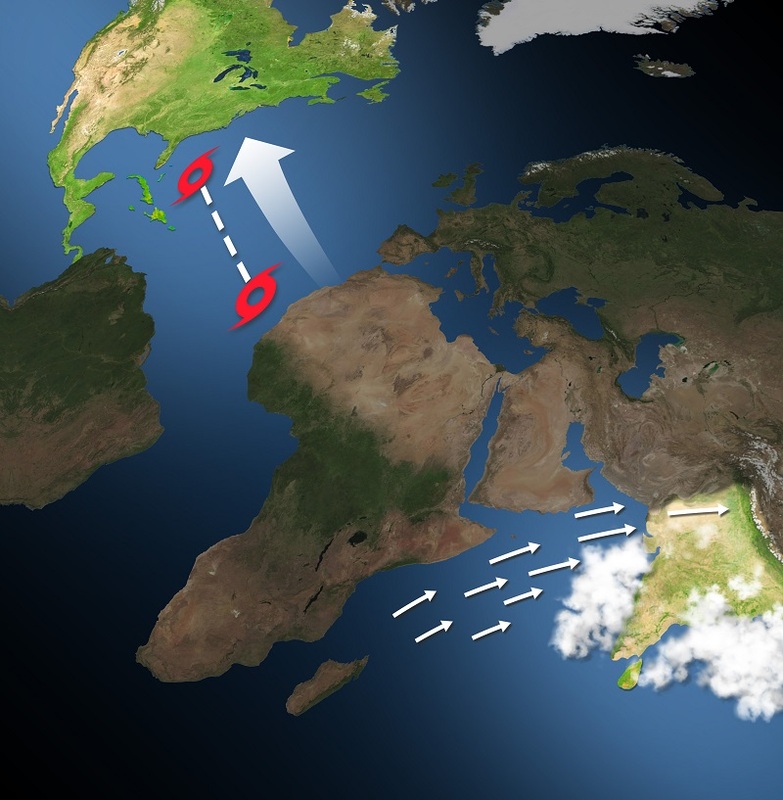 The link between steering effects and the Indian monsoon revealed by this research implies an increased probability of landfalling hurricanes during a strong monsoon. The results also suggest that previous attribution of similar effects to La Niña may partially be happenstance, since a strong Indian monsoon often occurs during La Niña events. Variability of the monsoon may serve as a remote source of predictability of Atlantic TCs, now and into the future. The North Atlantic subtropical high (NASH) is a large, semi-permanent high pressure system typically found south of the Azores in the Atlantic Ocean, whose winds dictate moisture pathways as well as the steering of Atlantic TCs. In this study, researchers sought to understand what causes historical variations of TC tracks in the North Atlantic basin. By combining observational regression analysis with a statistical track model, they showed that from 1970 to 2016, years with a stronger Indian monsoon were associated with a stronger NASH. This resulted in Atlantic TCs being steered farther westward toward the Americas. This work highlights variability of the Indian monsoon as an additional constraint on Atlantic TCs, implying increased landfall probability during a strong monsoon. Similar increased landfall probability has been previously ascribed to the La Niña (cool) phase of the El Niño Southern Oscillation (ENSO). This work disentangles the role of the monsoon from ENSO on Atlantic TCs, clarifying the monsoon as a driver of steering effects independent from ENSO. Sponsors: This work was supported by the Biological and Environmental Research program of the Office of Science of the U.S. Department of Energy as part of the Regional and Global Climate Modeling program. Research Team: Patrick Kelly, L. Ruby Leung, Karthik Balaguru, Wenwei Xu (PNNL); Brian Mapes and Brian Soden (University of Miami). Reference: P. Kelly, L. R. Leung, K. Balaguru, W. Xu, B. Mapes, and B. Soden, "Shape of Atlantic tropical cyclone tracks and the Indian monsoon." Geophysical Research Letters, 45(19):10,746–10,755, (2018). [DOI: 10.1029/2018GL080098].